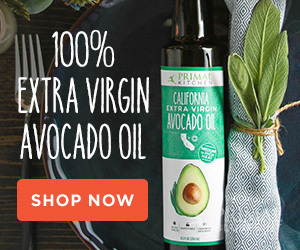 Today’s your last chance to get 10% off all PRIMAL KITCHEN™ products on PrimalBlueprint.com. Just pop coupon code “PALEOFX” in your cart before checkout. Infant helplessness predicts species intelligence. A low-FODMAP diet helps IBS patients. Many ancient Romans had really bad knees. Dark roasts have more bioactive coffee compounds than light roasts. Is this why cats and dogs can “go vegan”? An edible serving dish made of roasted eggplant halves stuffed with cinnamon and paprika scented lamb. How does that sound for dinner tonight? The eggplant is roasted until the texture is creamy enough to eat with a spoon. The ground lamb is cooked with onion, garlic and aromatic spices. Combined, the eggplant and lamb turn into a meal that is the definition of simple, healthy and delicious. I have been intending to submit my success story for the last few years, and I now realize why I was waiting. Even though I have lived Primally for the last 4.5 years I only decided to become a Primal Blueprint Health Coach and start a Primal wellness business in the last several months. A chiropractor told me about Mark’s Daily Apple in August of 2010. I signed up immediately for the ‘weekly’ email, which turned out to be daily. I loved that pace of information flow. After 14 months of reading all I could from Mark’s Daily Apple, and independent researching, I finally believed those postings to have merit. The success stories carried the most weight, as I could see how others benefited from going Primal. The stories of others who were similar weight and had similar health issues were the most compelling to me. I thought people who lost 180 lbs in 1.5 years, or 65 lbs in a year, had to starve and work out for hours several days a week. Boy oh boy, do I know otherwise now! I’ve gotten a lot of feedback about my leadership post earlier this year—particularly from people who connected with the humility aspect. It’s a characteristic I think most people would agree is in short supply these days, but most of us still admire it when we see it. In truth, little in our culture today encourages a humble disposition, and I think that’s a relatively new development. More than ever it seems to be the loudest, boldest, and (often) most obnoxious voices that garner our attention. Brashness somewhere along the line became an asset rather than an irritation. We’re told we need to do more, be more, have more, “fight” for what what we presumably deserve, and push our way to the front if we want our good in life. Put yourself out there, talk yourself up, and—above all—look out for number one. Is anyone else exhausted by these instructions? The key (and related) question of the day, however, is this: what would Grok have said about this social shift?